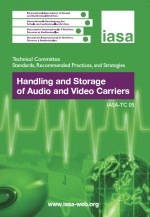 IASA Technical Committee, Handling and Storage of Audio and Video Carriers, edited by Dietrich Schüller and Albrecht Häfner. First edition 2014. (= Standards, Recommended Practices and Strategies, IASA-TC 05). International Association of Sound and Audiovisual Archives. Although the methodology of audiovisual long-term preservation by digitisation had been universally accepted by the end of the 20th century, there remains a considerable part of the audiovisual legacy that is still stored on its original carriers. The main reason is obviously the lack of funds. But also lacking is a sense of urgency to complete the digitisation of content. There is an ever-decreasing time window to complete the digitisation process before the small pool of equipment in operable condition required for the replay of traditional formats vanishes. Today, this window is estimated to be between 10 to 15 years, which makes the provision of optimal storage conditions imperative. This is particularly important for archives in hot and humid climatic zones. The purpose of this publication is to assist stakeholders to optimise storage conditions as an interim measure before professional longterm preservation through digitisation can be funded and organised. as a downloadable PDF, priced at €10. Order IASA publications (link to IASA online shop). IASA Members may also download a free PDF version. Italiano: "Gestione e archiviazione dei supporti audio e video"
Espanol: "Manejo y almacenamiento de soportes de audio y de video"